Pellay Maryvonne. Delacroix Eugène [Internet]. Version 1. maryvonnepellay. 2009 Déc 28. Available from: https://maryvonnepellay.wordpress.com/article/delacroix-eugene-370200hmdst2s-57/. 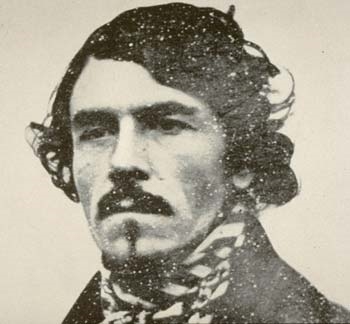 From a well-off family, Eugene Delacroix’s childhood was disrupted by the death of his father when he was seven and his mother when he was sixteen. Introduced to art by his painter uncle, the portraitist Riesener, at the age of seventeen Delacroix entered the studio of Guerin. Here he met Gericault, whom he admired, before entering the Ecole des Beaux-Arts the following year. The young man worked hard on his studies of nudes, drapery and casts, as well as on copies after Raphael and Rubens. He occasionally abandoned Academic constraints and tried his hand at water-color, lithography and even caricature. His debut at the Salon of 1822 caused quite a stir: Dante and Virgil in Hell attracted both thunder from the critics and approval from the state. His dandyishness, brilliant conversation and contradictory personality – »an erupting volcano beneath a sheet of ice » – made him rapidly sought after across the whole of Paris. A passionate lover of Shakespeare and Byron and the friend of English painters in Paris, Delacroix went to London. On his return, he frequented the Cenacle, where writers, painters and musicians, all ardent defenders against the classicists of a theatre representing passion, gathered around Victor Hugo. After exhibiting The Death of Sardanapolis at the Salon of 1827-1828, Delacroix became the leader of the Romantic school of painting. His audacious choice of subjects, colors and brush-work provoked a new scandal. This time the state did not buy the picture, and the artistic authorities even asked the painter to »change his style ». But the artist defended above all else his creative freedom. At the beginning of the 1830s, Delacroix seized the opportunity to accompany the new French Ambassador to Morocco in order to discover this exotic Orient. The countryside, towns and local people inspired thousands of drawings and sketches, which he drew upon until the end of his life. 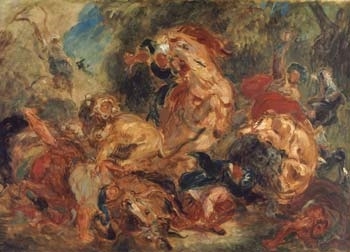 On his return, Delacroix, still in search of official recognition, executed several huge decorative wall-paintings commissioned by the state (Versailles, the Louvre, the National Assembly, the Hotel de Ville, the Church of St. Sulpice), continued to send paintings to the Salon regularly, as well as maintained his hectic »man-about-town » social life. He brushed shoulders with the personalities of the time, including Alexander Dumas, George Sand and Chopin. Suffering from personal problems and repeated attacks of tubercular laryngitis, Delacroix often retreated to the isolation and peace of the countryside. After a thirty-year long career pursued under different regimes, Delacroix experienced real success at the Universal Exhibition in 1855 and, two years later, the ultimate honor of his election to the Institute, after six failed attempts. But he grew gradually weaker and died in Paris in 1863. Classical and Romantic at the same time, worldly and solitary, Delacroix bore the contradictions of his era, revealed in his Journal. The last of the great painters to master all the genres, he heralded, through his experiments in color and brushwork, modern painting, Impressionism and Fauvism. 1863: dies in Paris, buried at Père-Lachaise cemetery.